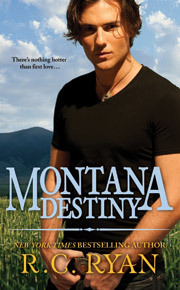 Montana Legacy was been picked by Cosmopolitan for its June Red Hot Read, (that's a 2-page spread, folks!) Keep an eye out for when it hits newstands! She was the one person who shook Jesse McCord’s quiet determination. She was the only one he ever let in, body and soul. Then suddenly Amy Parrish left without warning — or a word — and the oldest McCord cousin devoted his life to the family ranch. Now Amy is back, caring for her ailing father and offering Jesse help in finding the legendary McCord gold. With luck, his pride will keep him safe from her irresistible charms — and his own unexpected desire . . .
Amy isn’t about to give Jesse a second chance. She’s keeping her assistance strictly business, even if the hungry look in Jesse’s eyes is getting harder and harder to resist. But under the wide prairie skies an unseen enemy is fast closing in, threatening Amy and Jesse’s very lives and the promise of their . . .
Great reviews for Montana Legacy! Heart-melting sensuality and rowdy but loving family interactions warm the pages of this engaging story... skillfully refreshes a classic trilogy pattern and sets the stage for the stories to come. I loved this book. The story is so rich with excellent characters and wonderful plots. ...hot cowboys and loving relationships are in the forefront. I'm so glad there are two more books in this amazing series. Montana might be a large state, but there's always room for men like the McCords. ...Ms. Ryan has penned a fresh, entertaining tale that will keep you wanting to read more.